I hated to waste a day, but just didn't feel very energetic on Day 3 and realized if I was going to be at a crowded and very noisy event from 4:30 p.m.to after 10 p.m. I needed some downtime. Today in retrospect I realize I might be coming down with a cold. Crossing my fingers that it holds off until I am home tomorrow night as who wants to spend 7 hours traveling on an airplane with a cold coming on? Breakfast was stretched over a leisurely 2 hours as I caught up on emails and spent time writing which is always so very relaxing. As I had loaded my room with healthy nibbles and bottled water on Day 2, I had all I needed for a lazy bones day. Naps, alternated with writing, a little TV and a steaming hot bath were all on the agenda. As I looked out at the cold, but beautifully sunny day, I questioned this decision several times, but in the end the evening was so much more enjoyable. As there are no new photos to share, I thought I'd include this one as my husband found it the funniest. 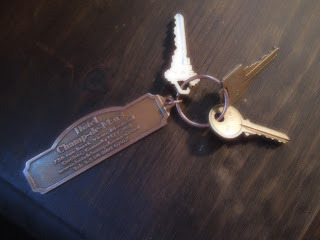 This whopping set is what you are given at check in at this old heritage hotel - not one, but 3 keys plus heavy fob. One is for the front door if I return after 11 p.m., one is for the door that opens onto the stair well and the last is for my room. I can't remember the last time I had an old school key instead of the room card you swipe.